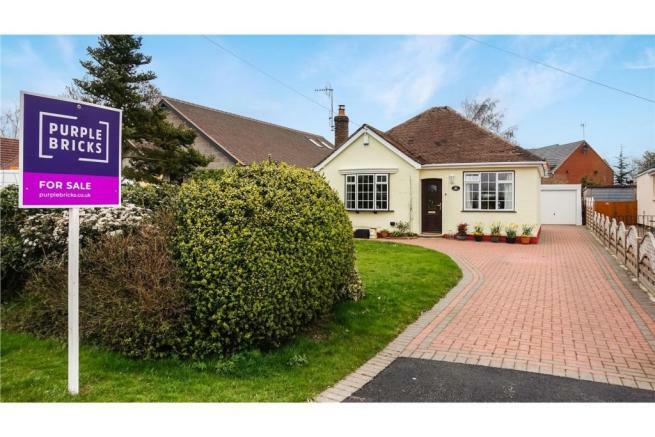 Purplebricks are delighted to offer for sale this extended and superbly enhanced detached bungalow occupying an enviable elevated position within a highly regarded area of Pershore. With lovely open views toward Bredon Hill to the front and providing incredibly well maintained accommodation, that has recently been redecorated and carpeted, surrounded by most attractive gardens. Together with ample parking, garage and superb versatility and future potential if desired. The delightful home is approached over an attractive lawned forgarden with well stocked seasonal flower beds, beautifully secluded with hedging to the front and having a block paved driveway beside creating ample parking, continuing to the garage and in turn having a pathway leading to the front door and round to the side access and rear. A useful porch then allows access through to the welcoming hallway providing access to the main accommodation. The delightful sitting room situated to the front, enjoys a bow window, framing the pretty aspect towards Bredon Hill as well as having a wonderful newly installed ‘Morso Swift’ solid fuel stove mounted on a slate plinth, creating a wonderful cosy atmosphere. Situated to the rear of the home, incorporating the extension is the superbly spacious, open and social kitchen dining room, enjoying a dual aspect with window to both the rear and side and in turn accessing the rear porch/utility. The modern kitchen has been beautifully designed to create a well equipped fitted kitchen space, effectively opening to the space for a dining table. The kitchen area has vinyl flooring and contrasting tiled surrounds and spotlighting, whilst comprising a range of matching wall and base units incorporating granite effect work surfaces, with inset one and a half bowl sink and drainer and integrated oven, ceramic hob and extractor cooker hood above and space for a fridge freezer. With useful utility/rear porch to the side, which in turn has a rear door access and provides ample space and plumbing for appliances. A spacious shower room provides a modern matching suite comprising of a fully tiled walk in shower cubicle with mixer shower, W.C. and a vanity unit with useful cabinets beneath and illuminated mirror above. Co-ordinated beautifully with tiled surrounds and contrasting tiled flooring, with a cleverly designed waterproofed floor to the shower and a heated towel rail. In addition the recently replaced Worcester Bosch boiler is housed within a cupboard. Externally to the rear of the home is a generous mature garden, fully enclosed by fencing and having an initial paved terrace creating a lovely seating space, whilst overlooking the shaped lawns, with block paved pathway meandering to the rear and to the greenhouse. Enjoying well stocked herbaceous planted borders, mature specimen trees including an Apple, Plum and Pear, as well as having a lovely summer house. A secure gate allows access to the driveway whereby a useful log store can be found and access to the garage. Having an up and over door, power and lighting. 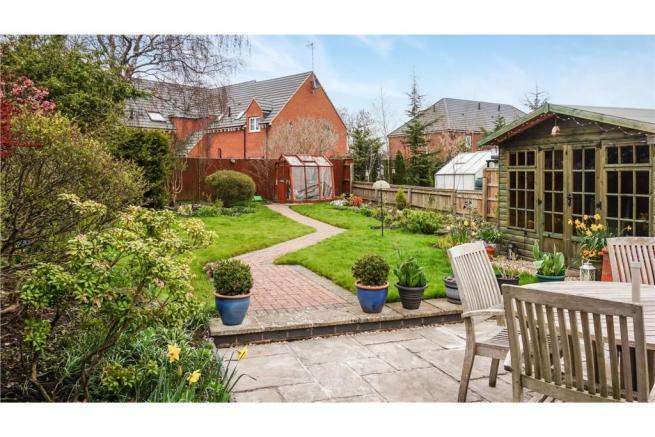 Holloway is situated in a popular residential part of Pershore which gives easy access to the town facilities. The property has gas central heating and double glazing. The market town of Pershore is Georgian styled and provides high street shopping facilities and supermarket together with an indoor market and a leisure complex. The river Avon runs to the east of the town lending itself for scenic walks and leisure pursuits. There is a medical centre and a new hospital and town library, together with excellent educational facilities within the area. Pershore now has Number 8 which is run by voluntary help and provides theatre activities, a cinema, ballet and yoga classes and is very much a part of Pershore community living. The neighbouring village of Great Comberton has an eighteen hole golfing facility with major golf clubs at Fladbury and Bishampton. Off Station Road there is the railway link to London Paddington or Worcester Shrub Hill travelling on to Birmingham. The motorway is approximately nine miles distant at Worcester junction 7 bringing Birmingham to the north and Bristol to the south within commutable distance. Other main centres are Stratford-upon-Avon with the theatre and racecourse, Cheltenham with National Hunt horse racing and the Everyman Theatre and major main shopping, Worcester with the famous Cathedral and equally famous cricket club together with the river Severn and good shopping centre. Disclaimer - Property reference 695493-1. The information displayed about this property comprises a property advertisement. Rightmove.co.uk makes no warranty as to the accuracy or completeness of the advertisement or any linked or associated information, and Rightmove has no control over the content. This property advertisement does not constitute property particulars. The information is provided and maintained by Purplebricks, covering Central England. Please contact the selling agent or developer directly to obtain any information which may be available under the terms of The Energy Performance of Buildings (Certificates and Inspections) (England and Wales) Regulations 2007 or the Home Report if in relation to a residential property in Scotland.